I am updating and improving the page as I find out more. Please forgive me if I make mistakes and let me know via the contact page of this website. I will try to use facts or information in the public domain unless I have permission to use copyright material. This is an exploration. You will see there are holes and question marks. In 2015 I started by researching press cuttings, family documents, letters, sketch books, film and photographs to piece together this chronology. From 2016 to date I have gained additional insights and facts from books and documentaries. These include a BBC TV Nationwide interview with Stella in 1974, English Portrait Miniatures and Miniatures Dictionary and Guide by Daphne Foskett , A Dictionary of Miniature Painters: 1870 - 1970 and portraitminiature.blogspot.com by Carmela Arturi and Frederick Roger Phillip, Alexander Korda (1959) by Paul Tabori, Alexander Korda, The Man Who Could Work Miracles (1975) by Karol Kulik, Charmed Lives (1979) by Micheal Korda, Korda Britain's Movie Mogul (2002) by Charles Drazin, the BBC TV documentary The Golden Years of Alexander Korda (broadcast in 1969). Also, in July 2016, I was able to spend useful hours at the Margaret Herrick, Academy of Motion Picture Arts and Sciences Fairbanks Centre for Motion Picture Study in Hollywood; and the Frick Art Reference and Metropolitan Museum of Art libraries in New York. In November 2018, I found reference in the State Library of Victoria to Stella and Monty’s study and prize winning at the National Gallery School of Art. 27 November, Stella Elizabeth Lewis was born in Carlton, Melbourne, Australia. (Australian Passport has 1887; UK Passports has 1889. But in Monty's 1919 British passport while the date of Stella's birth is 1889 her age is given as 31, which is consistent with 1887 rather than 1889.). Her parents were James Joseph Lewis and Mary Lewis (nee Fennell). She was the third of four children: Ernest, Eileen, Stella and Samuel. At some point the family moved to Hadleigh, 22 Sussex Street, Brighton, Melbourne. 6 July, Montagu Marks was born. He was the second of four children: Craig (Roy), Monty, Kay and Enid. Enid was officially named Eva Enid Tetz Marks. Their parents were Solomon and Miriam Marks (nee Harris). Solomon was from Latvia and originally named Solomon Markus (or Mardus) Tetz. He escaped the Russian army draft in 1883 and immigrated to Australia, where he met and married Miriam. Miriam’s parents, Nathan and Esther Harris (nee Emma Morrison), had immigrated to Australia from London and lived in Melbourne and Ballarat. They later moved to Perth, first to Tynemouth Terrace, Hay Street and then to 8 Bennett Street, where many large family gatherings took place. 12 May, Monty's younger brother Kay Marks (who later changed his name to Harrison after his mother’s maiden name) was born. Monty’s family moved to 157 Adelaide Terrace, Perth. Stella was a pupil at University High School, Melbourne. In 1899 at the age of eleven she had only one ambition, to paint. (source: January 1951 Woman's Journal). A teacher persuaded her parents that she should be allowed to focus her studies on art. Monty was a pupil at Highgate Hill School, Perth. Monty left school aged 12 and worked for the world famous scenic artist, Phil Goatcher, who had settled in Perth. However, he was disappointed that his work was mainly just cleaning brushes. Monty and his parents joined the gold rush in Southern Cross. Stella studied for 5 years at the National Gallery of Victoria Art School in Melbourne, under Bernard Hall and Frederick McCubbin. National Gallery School of victoria Art School Students 1909: Stella (Lulu) with scull, Monty seated centER. February, Monty made his first professional exhibition in Perth, 'Summer Paintings' at Theosophical Society Rooms, West Australian Chambers. He gave his permanent address as 'The National Art Gallery', Melbourne. 1911 - Académie de la Grande Chaumière and Slade School. Monty and Stella sailed from Australia to England. Monty continued to study in Paris, at The Académie de la Grande Chaumière, and in London, at The Slade School of Fine Arts (under Henry Tonks). October, 16 year old Kay sailed to Canada and the USA. 1912 - Stella Marks' first portrait miniature. Marriage. Stella painted her first portrait miniature. She was cajoled to do so by Monty and Penleigh Boyd, with whom Monty shared a studio in Paris. Penleigh had been asked to paint a miniature, but did not think it was in his line of work. So, the men persuaded Stella to have a go. (source: 9 December 1937 The Sydney Morning Herald, 22 January 1938 The Age). Late 1912 or early 1913? Monty and Stella exhibited at The Arts and Crafts Society, London [source: June 1913 Perth Exhibition Catalogue]. Monty and Stella were featured in the book, Australasians Who Count in London and Who Counts in Western Australia. It referred to a comment by the leading British landscape artist, Sir John Arnesby Brown, about Monty's 'Twilight' as "the most clever of any young artist's work he had seen, and the most promising". Monty and Stella sailed from London to return to Australia. On this trip Monty and Stella befriended the dancer, Maude Allan, and musicians, Leo, Jan and Mischel Cherniavsky. 9 September, Monty and Stella's works were exhibited at The Western Australia Society of Arts at St Georges House, Perth. Stella's 21 miniatures were "a feature of the exhibition". While Monty's works included his watercolour, 'Twilight Chelsea' and a charcoal portrait of Sir Harry Barron, Governor of Western Australia, which was considered "certainly the best thing in black and white" [source: 10 September, The West Australian]. Stella's 'The Girl in White' miniature was exhibited in Athenaeum Hall, Melbourne. Monty and Stella set sail from Australia for London or Paris, travelling east via America. By July, Monty and Stella had reached New York (source: 18 February 1926 Table Talk), where Monty's brother, Kay, was working for 'The Lovett-Harrison Exporting Company'. 28 July, World War I started. On 4th August, Britain, Canada, Australia and New Zealand were at war with Germany. August, Monty and Stella decided to stay in New York temporarily. They, like most others, believed that the war would be over in a few months. Early in the year, Stella and Monty were living at 106 West 52nd Street, New York. March/April, Stella exhibited four miniatures at the The American Society of Miniature Painters Exhibition. A critique in The New York Times Magazine (4 April) praised the work of Laura Coombs and Stella Marks, commenting that Stella "makes her clear impression of doing a small thing in a large spirit". 'The Girl in White' was bought for $100 by a connoisseur from Akron Ohio. It was her first exhibition sale of a miniature as a newcomer to America. The exhibition was at the National Academy of Design, New York (now the National Academy). May/June, Stella Exhibited two miniatures at the Art Institute of Chicago. Although she had made a name for herself in Australia she was still not well known in America. That would change dramatically in 1916. Part of the 'Gum Tree' by Montagu Marks. Copyright Montagu Marks' Estate. all rights reserved. Private Collection. November/December, Stella exhibited three miniatures at the Pennsylvania Academy of Fine Arts. Bryant Park Studios, 80 West 40th Street, New York, home of monty and stella marks, As it looks today. December ?, Stella started two portrait miniatures of Aleister Crowley, the famous occultist. A preliminary drawing is in her sketch book dated 1915. However the miniatures were likely completed in early 1916. It is probable that one was given to Crowley, which is now lost, and the other kept by Stella for exhibition. There is evidence of at least two exhibitions of the work: in 1916 at the Pennsylvania Society of Miniature Painters and again in the February 1926 Exhibition at The New Gallery, Melbourne. [source: catalogues]. I also have a reference from an undated press cutting some years later that it was to be exhibited at the Royal Academy. However, I have not been able to find a Summer Exhibition catalogue that verifies it was exhibited there. Stella kept a black and white print of the version which is lost in her portfolio book and another black and white print was in Crowley’s diaries. Coincidentally, at the time Aleister Crowley happened to be a neighbour at Bryant Park Studios. Aleister Crowley 1915 or 1916, wearing X° O.T.O. Regalia. Portrait miniature by Stella Marks. Copyright Stella Marks' Estate all rights reserved. Private Collection.
? January*, Stella became a member of the Women's Painters and Sculptors Society of America [now the National Association of Women Artists]. In 1916 or earlier Stella also became a member of the National Association of Portrait Painters. February (or January)*, Stella became the youngest Associate Member of the Royal Miniature Society. She was proposed by Alyn Williams, Founder and President of the Society, and seconded by Bess Norris Tait, who was the only other Australian member at the time. Alyn Williams had seen Stella's 1915 miniature of Lucius Henderson worn by his wife Mrs. Studebaker Henderson. [*sources: 11 February 1916, Evening Sun refers to Stella's "recent election to the Royal Society of Miniature Painters". May 1916 The International Studio gave Stella the initial A.R.M.S. indicating her Associate Membership. 9 September 1916 The Billboard referred to Stella as "the youngest and only American member of the Royal Miniature Society". December 1916 Colour also referred to Stella being the youngest member of the Society. March 23 1918 The Pittsburgh Sun commented that Stella was "the youngest Associate Member of The Royal Miniature Society. 17 February 1926 The Age referred to Stella being a member of the Royal Miniature Society since 1916]. 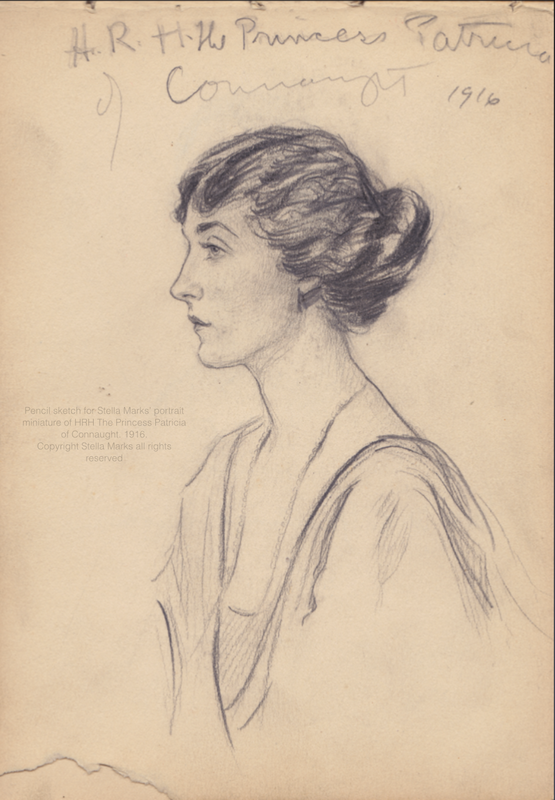 Pencil sketch for Stella Marks’ portrait miniature of H.R.H. The Princess Patricia of Connaught, 1916. Copyright Stella Marks' Estate all rights reserved. Private collection. May/June, Stella exhibited three miniatures at the Art Institute of Chicago. June, Stella Exhibited three miniatures at the City Art Museum Saint Louis. November/December, Stella exhibited three miniatures, Jan Cherniavsky, Aleister Crowley and Marjorie Willimason, at the Pennsylvania Academy of Fine Arts. December, Stella's work was shown in the National Association of Portrait Painters' Exhibition at Memorial Art Gallery, Rochester, New York. Letter from the Canadian Red Cross stating 30,000 copies of Stella Marks' miniature of Princess Patricia had been sold. 1917 - The Royal Flying Corps, Craig Marks dies and Monty survives. Friendship with Sidney Rielly. 6 April, the USA declared war on Germany. May, Stella was in Detroit to "paint portraits and miniatures". Monty's elder brother, Royal Flying Corp Pilot, Craig Royston, at Oxford in Spring 1917 just before his death. Monty joined the royal flying corp in July 1917. 4 October, Monty, while still in training in Canada lost the tail and part of the body of his plane when another plan collided into his. This was almost exactly five months after his brother had crashed and died. He dropped 500 feet and somehow was able to manipulate the wings to convert a straight fall into a slanting fall and crashed into a tree, which broke the impact. The flimsy plane was destroyed. Miraculously Monty walked away unharmed. Meanwhile, Monty's younger brother, Kay, was (apparently) in Japan “in charge of British film war propaganda”. (source: Variety 12 December 1962 page 71, Obituary). However, this seems rather unlikely and would need corroboration. Also, Sam Lewis, Stella's brother, who had moved to New York, joined the Royal Engineers. December, Monty set sail for England. Sidney Rielly was on the same ship. 1 January, Monty arrived in England and for the first few days stayed at the Savoy with Sidney Rielly. From England Monty wrote a series of letters to Stella painting in words, and with the vivid eye of an artist (and it appears with some exaggeration) his feelings and experiences of flying in the war. 11 November, World War I ended. Monty Marks' plane was named 'lazy lulu', after Stella Marks's nick name 'lulu'. The adjective 'lazy' was a joke. since stella was the opposite of lazy. Monty said the war had changed his thinking* and that he should become a "business man". Kay, after the war, became an independent film distributor in Japan and China. (source: Variety 12 December 1968 page 71, Obituary). However, this needs corroboration. 11 November, Armistice Day, Stella gave birth to a daughter, Sarah, who only lived a few hours. Monty and Stella visited Japan*. They sailed from Vancouver on the RMS Empress of Russia. Stella painted miniatures, including portraits of Lady Maxwell and Mrs. T. Akobashi, while Monty sold US$1.8 million of American product. The sales were "too good". So his promised commission of US$50 thousand was cut. But he still "did not do too badly out of it". October, Monty and Stella sailed from Japan back to the America on the RMS Empress of Asia. 11 November, exactly a year after their first daughter's birth and death, Monty and Stella's second daughter Patricia (Pat) was born in New York. She was named after Princess Patricia. 24 June, it was announced that Monty had set up 'The Winmark Producing Company' in New York with a capital of $50,000. His other investors/directors were, Roger Prosser and D.K. Kennard. At the same time his brother, Kay, was named as director of the newly formed 'Rockaway Aeroplane Swing Company'. (Source: 24 June, Moving Picture World*, page 746). The young family moved from New York City to Chatsworth Gardens Apartment in Larchmont, [or where they on Long Island itself and moved to Larchmont late 1926?. One Melbourne press source in 1926 says they lived at "Setanket" (Setauket? ), Long Island with a studio at Bryant Park Studios]. Stella's New York studio was at the Gladstone Hotel. December, Monty, Stella and Pat sailed to Australia from New York. 17-25 February, 22 of Stella's miniatures were exhibited at the New Gallery, 107 Elizabeth Street, Melbourne. Stella's Miniature of Maud Allen was purchased by the Felton Bequest for the National Gallery of Victoria. 26 March, the family set sail from Sydney back to New York. 5 February, Monty's brother Kay (now with the surname 'Harrison') married Heather Pond in California. They travelled to Japan. February, Monty was President of Gilmont Products Corporation (he had 23 shares). January 24 to February 16, Stella's miniatures were exhibited at The American Society of Miniature Painters annual Exhibition in New York. Monty's maternal grandfather, Nathan Harris, died. month ?, Monty was introduced to Alexander Korda by Robert Hatfield*, who he in turn knew via Herbert Kalmus of Technicolor. December ? Monty, Stella and Pat sailed from New York to visit the UK and France. March, Monty had another 1666 shares in Gilmont Products Corp.
Monty, Stella and Pat sailed back from the UK to New York. 24 October, The Wall Street Stock Market Crashed. July, Kay Harrison, as Chairman of Gerrard Industries, announced that Gerrard had acquired world rights – excluding the USA and Canada – for a new and fast process, Colourgravure, for printing colour images on paper. To exploit these rights a subsidiary of Gerrard, Colourgravure Ltd, was set up. Monty crossed the Atlantic on Norddeutscher, Lloyd Bremen line. 4 May to 8 August, three of Stella's miniatures were exhibited at the Royal Academy of Fine Arts: Mr. Justice McKenna of the Supreme Court of Washington, Knox Studebaker, and the 1916 portrait miniature of The Lady Patricia Ramsay (previously H.R.H. The Princess Patricia of Connaught). February, founding of Sir Alexander Korda's London Films Productions. Monty possibly had contact with London Films Productions (needs checking. If true this early association was kept secret for reasons that will become obvious). 12 October, 'The Private Life of Henry VIII' was given its world premièred in New York. It was distributed by United Artists, who had also provided vital financial backing to complete the picture. July, Monty initiated London Films Productions' relationship with the Prudential. (source: chapter 15 of 'A Sense of Security: 150 years of Prudential'. Granta Editions). According to Paul Tabori, in his biography of Alexander Korda, Monty was "the architect of the Korda-Prudential cooperation". However, according to Charles Drazin, in his biography 'Korda Britain's Movie Mogul', Monty, Korda and Sir Connop Guthrie jointly manoeuvred to persuade the Prudential to invest in London Films. The opening move was to draw the Prudential into the main deal via its investment in Gerrard Industries Ltd., whose subsidiary, Colourgravure Ltd., was developing the Hillman colour process for use in films. Sir Connop Guthrie was a director of both the Prudential* and Gerrard Industries* and Monty's brother, Kay Harrison, was Chairman of the latter. So it is was that Monty introduced Sir Connop Guthrie to Korda. It is likely that Sir Connop, Kay and Monty met in America after World War I. Sir Connop's wife, Eila, was Australian, the eldest daughter of Sir Malcolm McEacharn, former Mayor of Melbourne. Later in his biography Drazin suggests that Sir Robert Vansittart and Claude Dansey helped in the process of persuading the Prudential as a means of furthering the 'Z Organization', the secret network that paralleled MI6 before World War II. Drazin writes "......Dansey's circle of business associates included the two pivotal figures in the negotiations, Montagu Marks and Sir Connop Guthrie." It is also well known that London Films and Korda were involved with the 'Z Organisation' and Korda became close friends with Winston Churchill. Prior to World War II, Korda hired Churchill as a scriptwriter and advisor. After the Prudential's initial investment in London Films, Monty became its General Manager. He reported directly to Korda, and was responsible for much of the company's day-to-day operations, but ultimate decision making power remained with Korda. September, Monty chose and negotiated the purchase of land for Denham Studios. Monty put a deposit down on the land of 10,000 pounds (without approval from Korda, who was in Spain). Later Korda enthusiastically approved Monty's unauthorized action. November, Alexander Korda and Montagu Marks joined the board of directors of the Gerrard Industries's subsidiary, Colourgravure Ltd. and London Films' secretary, Harry George, also became secretary of Colourgravure (source: 11 November 1934 Motion Picture Herald). The other directors of Colourgravure were Geo. H Johnson, Major R.D.K. Curling MC and Kay Harrison. The family set up home at Hengrove, high on the Chiltern Hills in Buckinghamshire (30 minutes drive from Denham). Stella Marks with Sir Connop Guthrie on board his yacht, the Creole. January, the final purchase of land for Denham Studios took place. June, construction work on Denham Studios began. It was designed to rival Hollywood. The Prudential's funding made the ambitious project possible. 5 September, Alexander Korda became an 'owner-member' of United Artists, joining Samuel Goldwyn, Douglas Fairbanks Snr., Charlie Chaplin and Mary Pickford. By October Technicolor, Gerrard Industries and the Prudential had registered Technicolor Ltd. in the UK. Kay Harrison became its Managing Director, Dr. Herbert Kalmus Chairman and Sir Adrian Baillie Vice-Chairman. The switch from Hillman to Technicolor was because it appeared to be the better system and had been used by United Artists. Monty negotiated contracts details with a number of stars, including a then relatively 'unknown' Vivien Leigh. Playwrights, actors and directors are regular guests at Hengrove. 2 March, Monty received 10,000 shares in London Films Productions Trust Limited. 4 May to 8 August, three of Stella's miniatures were exhibited at the Royal Academy of Fine Arts: Mrs. Adam Gimble, Miss Marjorie Williamson daughter of theatrical producer J.C. Williamson, and Patricia Stella's daughter. Summer, Stella’s sister, Eileen, stays at Hengrove. 3 May to 7 August, two of Stella's miniatures were exhibited at the Royal Academy of Fine Arts: Mrs. Arthur Kelly and Mrs. Edward Oakford. May to ?, Monty’s and Kay’s sister, Enid, her husband, Harold Baldwin, and their daughter, Joan, visted the UK. October, Pat was sent to finishing school in Lausanne, Switzerland. 29 October, Monty and Stella set sail from the UK to Australia on the RMS Strathaird via Egypt (Suez Canal) and Ceylon (Sri Lanka). Monty took on the additional role as General Manager of 'London Imperial Pictures'. His mission was to expand the market for British films across the Empire and thus compete better with Hollywood. This strategy was in Alexander Korda mind back in January 1935 when he observed that total receipts from Australia were less than the profit he had already made on the run of The Scarlett Pimpernel at the Leicester Square Theatre [source: Karol Kulik and BFI press cutting]. In particular Monty would lobby for the removal of quotas and assess the establishment of a permanent studio in Australia. He also was there to meet with Cecil Marks, General Manager of United Artists, Australasia. Monty's hope was for the production of Australian films with strong, universal stories; films that would show the world the sophistication, modernity and beauty of his homeland and move away from previous clichéd images and caricatures of Australia. November (beginning of the month), three just completed Films (Paradise for Two, The Return of the Scarlett Pimpernel and South Riding) were flown to Monty's ship then in Marseilles for him to arrange world premières in Australia. 30 November, Monty and Stella stopped over in Fremantle, Perth. They were welcomed by Eric Lamb, Western Australian Manager for United Artists. 6 December, they stopped over in Melbourne. 8 December, Stella and Monty arrived in Sydney. 14 December, Monty praised Ken G. Hall's Australian film Lovers and Luggers after a private showing. 16 December, Monty and Stella attended the première of 'Balalaika' at the Theatre Royal. December, at the Millions Club, Sydney, Monty met with film executives at the Council of the British Film Industry Association of Australia and New Zealand. During this year London Films Productions was in complex discussions* regarding the control of United Artists. 1938 - Continued visit to Australia and New Zealand. Stella Marks' miniature of Justice McKenna bought by Felton Bequest. Film quota problems. Propaganda. Return to the UK via Ceylon. Monty leaves London Films. Douglas Fairbanks Senior, Montagu Marks and Sir Adrian Baillie set up Fairbanks International. 15 January, 'Paradise for Two' Australian première at the Athenaeum, Melbourne. 1 February, Monty flew to Brisbane for two days. 2 February, Monty urged Sunday evening opening of cinema's in Australia with a % of takings supporting local quality production. 7 February, they arrived in Auckland and were met by B. Allen, New Zealand Manager of United Artists. 14 February, Monty was the guest of honour at the 33 Club. 25 February, after the film quota debate in House of Commons on 24 February, Monty tried to reassure the Australian film industry, "I am quite positive there will be no law passed in England that will discriminate against Empire film".
? to May, Stella's work was exhibited as part of the '150 Years of Australian Art' celebrations at the National Art Gallery of New South Wales, Sydney. [source: 22 January 1938 The Argus (Melbourne)]. 1 March, Monty and Stella set sail on the RMS Orion from Sydney to the UK. With storm clouds gathering in Europe, during the January and February months of the Australasian tour, Monty's message became more political: he argued that the emotional power of film to influence national sentiments was greater than the press. Thus, the responsibility of film producers was even greater than newspaper editors. He wrote, "The strongest propaganda in the world is entertainment" and referred to the ideal of "England and Freedom" embodied in The Scarlett Pimpernel. He also advocated a British owned chain of cinemas across the Empire. "What would be said if all the newspapers were controlled by a foreign owner with anti-British tendencies?" he asked. As someone who had called Australia, America and Britain 'home', he believed that America and Britain, with their shared belief in democracy and freedom (albeit with different cultures), should 'stick together' against the looming threat. 15 March, Monty and Stella reached Ceylon (Sri Lanka). April, Monty and Stella arrived back in the UK. April, negotiations on Monty leaving London Films. By the summer he had left. This appeared to have coincided with the Prudential's growing disenchantment with Korda, as expressed by Sir Percy Crump in an internal memo. (Source: 'A Sense of Security: 150 years of Prudential'. Granta Editions). April?, Monty had a meeting with Winston and Randolph Churchill over a private lunch with Korda. 8 July, Monty and Sir Adrian Baillie MP had set up Albion Films, with initial capitol secured by Swiss interests of over $2,000,000 ($34,000,000 in 2016 value). The company was formally announced on 12 July. (sources: 9 and 13 July 1938 Variety). Sir Adrian Baillie was a Director of Technicolor Ltd, the British company run by Kay Harrison, Monty's brother. Sir Adrian Baillie was also a cousin of John Whitney's wife. John Whitney and his cousin Cornelius Vanderbilt Whitney were major investors in Technicolor. 7 November, it was reported that Monty and Sir Adrian Baillie were planning a $2,500,000 (over $42,000,000 in 2016 value) partnership with Douglas Fairbanks Sr. and United Artists. Monty, "head of Albion Films", was "on his way" to Hollywood. (source: Motion Picture Daily 7 November 1938). 9 - 10 November, Kristallnacht in Germany and Austria. 10 November, Monty arrived in New York and flew to Hollywood to confer with Douglas Fairbanks Sr. (source: Motion Picture Daily, 11 November 1938). 15 November, Monty and Douglas Fairbanks Sr left Hollywood for New York (source: Variety Daily front page, 11 November 1938). 16 November, Monty and Douglas Fairbanks Sr. were reported to be forming a partnership between 'Albion Films Ltd.' and 'Douglas Fairbanks Productions Ltd.', to make a minimum of three films with a budget of $2,500,000. In addition to Monty, Baillie and Fairbanks, other key people involved were David O. Selznick, John Hay Whitney and George Archibald. [Source: 16 November Variety]. 6 December, 'Fairbanks International' was announced in London. [source: 6 December cablegram from Selznick to Douglas Fairbanks Sr. and Monty; 7 December London Evening Standard and Variety]. 10 December, Monty sailed back to America for meetings on Fairbanks International. 28 January, Monty, Sir Adrian Baillie and Fairbanks were guests at a dinner in Hollywood attended by numerous other producers and stars. Late February, 'Variety' reported that Monty would be back in Hollywood (from London) when "final details will be set forth for outfit's [Fairbanks International's] initial production for United Artists." During the year plans for Fairbanks International films continued*. Stella's miniature of Lady Swan was exhibited at the Royal Academy. (source: Stella's note. ? but not found in Summer catalogue). 1 September, after its pact with Russia, Germany invaded Poland. 12 December, Douglas Fairbanks Sr.'s sudden death of a heart attack aged 56, combined with the war, finally scuppered the plans of 'Fairbanks International'. 6 May to 10 August, two of Stella's miniatures were exhibited at the Royal Academy of Fine Arts: Patricia and Miss Betty Ince. January, with the threat of Spain joining the Axis powers - or of a German invasion - taking Gibraltar and thus controlling the Mediterranean and North Africa, Monty flew to Spain via Lisbon for propaganda and other activities under cover of producing a film, 'Christopher Columbus'*. Monty was part of the British effort to keep Spain neutral. Earlier, the Ambassador, Sir Samuel Hoare, had suggested to Churchill that he ask Alexander Korda to recommend ways to spread the British viewpoint in Spain**. This is likely how Monty ended up in Spain. Monty had previously met Churchill through London Films. His links to Sir Robert Vansittart and the intriguing story behind the original financing of London Films, alluded to in Drazin biography of Korda, may have qualified him for the role. The fact that years earlier Monty had been a friend of Sidney Reilly may (or may not) have been a factor. To help him in Spain the British Embassy's Press Attaché, Tom Burns, introduce him to a young Irish-American Catholic, Aileen O'Brien. As a devout Christian and charismatic advocate against communism, with a determination to make sure that Stalin style regimes would not succeed elsewhere, she actively supported the Nationalists in the Spanish Civil War and thus became well connected with Franco's Government. She also opposed Nazi Germany, which she considered no better than the communists. She had useful access to high level anti-Axis circles in Spain and was also engaged to and after the war married Baron Felix von Vittinghoff-Schell, a Catholic German aristocrat who refused to fight for Hitler. Monty worked with, and became close friends with, Hugh Ellis-Rees, Financial Advisor to the British Embassy (the Ministry of Economic Warfare's representative in Madrid). After the war, and in retirement, Alan Hillgarth visited Monty in London on numerous occasions. So it is clear that during the war Monty and the Naval Attaché were connected. In a letter written in 1964 to his relations, Cliff and Rae Harris, Monty alluded to his activities: "we did 'funny' things for our Govt., which was acknowledged in a book written by the Chief of Staff". It is likely that Monty, as an "independent" film producer, was able to channel money for clandestine activities that the British Government did not want to be directly associated with*. One of Monty's activities was to help arrange passage back to England for escaped Prisoners of War and Jews, who had made it over the Pyrenees to Spain. Another likely activity was filming the Mediterranean coast. However, using films to aid the propaganda effort was his most obvious task. During this time Monty converted to Roman Catholicism and remained devoted to the faith for the rest of his life. Stella & Pat moved out of Hengrove, which was taken over by Government for war communications activity. Stella's address up to 1945 is Bacombe Rise, Wendover, Bucks. March and April, Stella painted a miniature portrait of Sir Winston Churchill (not from live sittings). Stella's miniatures were shown at the Royal Academy. (? not found in Summer catalogue). Summer, Pat joined the First Aid Nursing Yeomanry as an ambulance driver. 7 December, Pearl Harbour and America declared war on the Axis powers. 'Mary Churchill' after a portrait miniature by Stella Marks, 1941. Copyright Stella Marks' Estate all rights reserved. Montagu Mark's Letter: ChuRchill, and we did 'Funny' Things For Our Govt. in Spain DurinG the last war. Monty's address was Avda. Del Generalisimo, 9, Madrid. 1 June, actor Leslie Howard was tragically shot down by the Germans on a flight back to Britain following a propaganda visit to Spain and Portugal. Monty knew Leslie Howard well from London Films Productions. He played the title role in 'The Scarlett Pimpernel' and visited Hengrove a number of times before the war. In Spain he was mostly famous for his recent role as Ashley Wilkes in 'Gone with the Wind', produced by David O. Selznick. He, like Monty, was of Jewish decent and strongly anti-Nazi. He had produced and starred in the war propaganda films: 'Pimpernel Smith'*, about rescuing Jews from Germany, and his last film, 'The First of The Few', about the designer of the Spitfire, which was released in America just days after his own death. 18 June, Stella's portrait miniature of Miss Betty Ince of Melbourne was stolen from the Royal Scottish Academy. It was never found. Stella had a studio at 18 The Bolton Studios, Gilston Rd. London SW10. Monty was 'Production Manager' of a Spanish film comedy, 'Castillo de Naipes' (House of Cards), based on a story by Aileen O'Brien. Good cover for their real activities. Monty spent the summer at a cottage, 'El Canuto', near Gibraltar. October, Monty’s father died in Sydney. 8 May, Germany surrendered. Monty celebrated V.E. Day with his brother, Kay, in Madrid. Stella was in the UK and Pat in Brussels. 12 July, Pat flew from Paris to visit Monty in Madrid for a week. 9 - 12 August, Monty and Pat met again in Paris, together with the actor, Leslie Banks. February, Monty, Aileen O'Brien and Marita flew to the UK from Madrid. Stella had retaken Hengrove for Monty's arrival. Monty nearly killed himself and Aileen in a car crash while driving his Buick in snow. June to Nov?, Monty, Stella Pat and Aileen visited Spain and Gibraltar. 1948 - Prince Philip commissions Stella Marks to paint a miniature of Princess Elizabeth for her 23rd birthday. Monty appointed London represenative of Argosy Pictures. February, Monty made a trip to Madrid and Dublin. 12 July, Stella’s mother, Mary Lewis (nee Mary Sarah Fennell), died aged 93. August, Stella and Monty were in Spain. Stella seemed to be living in London. (Redirected mail from Hengrove to The Studio, Melina Place, St Johns Wood). 1950 - Pat is married. Princess Elizabeth commissions Stella Marks to paint miniatures of Prince Philip and Prince Charles. Montague Marks sets up Film Locations Ltd. with Kay Harrison. 29 April, Pat married John Pettifer at St George's Hanover Square, London. With his film enterprises stalling, Monty was in debt and was forced to sell Hengrove. 22 September, Monty and Stella's first grandson, Michael, was born. December, Monty and Stella moved in to live with Pat and John at 27 Pembroke Gardens, Kensington, London. 1952 - Queen Elizabeth II commissions Stella Marks to paint a miniature of Princess Anne. Ambitious plans for Film Locations. Mike Frankovich. January, Monty was in Madrid setting up deals and financing for the Film Locations Ltd. production of 'Decameron Nights' (based on Boccaccio's stories). He had become involved with Mike Frankovich at the early stage of the latter's career as a producer. Frankovich was not at this time a shareholder of Film Locations Ltd., but a few years later was to take it over. He had met Monty since Mike's wife was the actress, Binnie Barnes. 6 February, H.M. King George VI died and H.R.H. The Princess Elizabeth became H.M. Queen Elizabeth II. In March, Monty wrote to his brother: "Nothing is too big for us. Let us earn in the autumn of our lives what we have lost in the summer". He talked about the two brothers building something that would last - a legacy for their grandchildren. There were ambitious plans to produce 'Salammbo' (based on Flaubert's novel), 'Carmen' and a number of other films. May, Stella and Monty were in Spain, where 'Decameron Nights' was being filmed. Stella painted a miniature of the actor Sir Godrey Tearle, as the character, 'Ricciardo', for a miniature worn by Joan Fontaine's 'Bartolomea' in the film. She also painted a portrait miniature of María del Carmen Franco y Polo, the Marquise of Villaverde (Franco's daughter). August, Monty (due to Kay's Technicolor influence in India) got the western hemisphere and European distribution rights for the highly acclaimed 'Aan', India's first Technicolor film, starring Dilip Kumar, Nimmi and Prem Nath. It was at a party in Pembroke Gardens that Nimmi famously turned down Errol Flynn's advances towards her. 'Kay Harrison' after an oil portrait by Stella Marks. Copyright the artist all rights reserved. January/February, Stella was commissioned by Woman's Illustrated to paint a commemorative oil portrait of H.R.H. The Prince Charles. April*, it was announced that Richard Sale under the banner of Film Locations Ltd. would produce 'Gentlemen Marry Brunettes' (a sequel to 'Gentlemen Prefer Blonds'). However, eventually the film was produced by Russ-Field Corp.
August/September, Stella was commissioned by Woman's Journal and Woman's Pictorial to paint two commemorative oil portraits of H.R.H. The Princess Anne. Oct 20, Film Locations Ltd. started production of 'Fire Over Africa'/'Malaga' starring Maureen O'Hara (who recently had had great success in 'The Quiet Man'). The Director was Richard Sale and Vincent Korda was Art Director. According to notices, e.g. Variety 1953 November 13th (page 10), 20th (page 10) and 27th (page 10), Frankovich was billed as Producer and Montagu Marks and Colin Lesslie as Associate Producers of 'Fire Over Africa'. But, subsequently Monty's name has been omitted (e.g. on IMBD's website). Oddly Montagu Marks and Colin Lesslie were originally billed as the Co-producer of Malaga (the name of the film in Britain and some other locations) with Frankovich omitted on early notices (see 1954 below). It seems that around this time Mike Frankovich was in the process of taking over control of Monty's company, Film Locations Ltd.
December, at 27 Pembroke Gardens Stella painted a portrait miniature of her and Monty's friend, Maureen O'Hara. Maureen O’Hara 1953. After a portrait miniature by Stella Marks. Copyright Stella Marks' Estate all rights reserved. 1 January, 'Malaga' was released in the UK, distributed by Sir Alexander Korda's British Lion Films. A notice on the 1 January in Monthly Film Bulletin (page 121) and a review on 24 July in Picturegoer (page 19) billed Montagu Marks and Colin Lesslie as Co-producers (with no mention of Frankovich). 16 March, Monty and Stella's second grandson, Anthony, was born. March, plans for an indie production of 'Rendezvous in Vienna' starring Paul Henreid and (possibly) Ingrid Bergman, co-produced by Henreid and Monty were announced (source: Variety 17 and 24 March 1955). Ingrid Bergman had starred with Paul Henreid along with Humphrey Bogart in 'Casablanca'. 23 January, Sir Alexander Korda died. According to Tabori, Monty said "when Korda died, I died too." It was at this time that Monty started to reconsider what to do with the rest of his life. 28 October, Monty and Stella's granddaughter, Annie, was born. She was christened "Anne Maureen" after Maureen O'Hara. Alexander Korda portrait by Montagu Marks, circa 1954. Copyright Montagu Marks' Estate All Rights Reserved. private collection. From the end of World War II to 1956 Monty had attempted to make a big return to the film business. Together with his brother he set up Film Locations Ltd.
His plans included a co-production with Paul Henreid in a film co-starring Ingrid Bergman. Also productions of 'Salammbo' and 'Carmen'. He went into business with Mike Frankovitch. He co-produced 'Decameron Nights' and 'Malaga'. He used his connections in Spain to help facilitate locations for many other films. These included locations for the Battle of Bosworth in Laurence Olivier's and Korda's production of 'Richard III', and Robert Rossen's 'Alexander The Great'. But, disillusioned by the death of Korda, losing control of Film Locations Ltd. and approaching 70 years old, Monty started to loose his vigour. He turned back fully to his first love, painting. Stella's miniature of Lady Swan received an Honorable Mentions at the Paris Salon Exhibition. Paying homage to two fellow Australians, Monty painted an oil of Eileen Joyce playing at The Royal Air Force 50 Anniversary Concert and a portrait of his friend Michael Parker, who had been The Duke of Edinburgh's Private Secretary. 1959 - Monty paints Maureen O'Hara. Move to 64 Addison Road. Monty and Stella moved to 64 Addison Rd. Kensington, London. An important attribute was a large studio with a north facing light. 'Roses for maureen' a still life in oils by Montagu Marks, 1959. Copyright Montagu Marks' Estate All rights reserved. private collection. A Portrait of Maureen O'Hara by montagu marks 1959. Copyright Montagu Marks' Estate All rights reserved. private collection. January, Monty's work was exhibited in Cologne. 17 to 27 July, Monty's paintings were exhibited in Dublin. 5 December, Monty's younger brother, Kay Harrison, died while attending Technicolor meetings in Hollywood. Stella was commissioned by H.M. Queen Elizabeth II to paint a portrait miniature of H.R.H. The Prince Edward on his 4th Birthday. 10 August, Monty was interviewed in the BBC Television documentary, The Golden Years of Alexander Korda. 6 July, Monty spent his 80th birthday at Schloss Kalbeck with his close friends Baron Felix and Aileen von Vittinghoff-Schell. Stella painted a portrait miniature of H.R.H. The Princess Anne on her 21st Birthday. 14 September, Monty died of a heart attack at Norton Court, Kent, England and is buried at Norton Church. Stella's eyesight, which had been gradually deteriorating, was making painting, especially miniatures, more and more difficult. 16 December, Stella was interviewed and a number of her miniatures shown on BBC One Television's news and current affairs program, Nationwide. October/November, aged of 89 years and with blindness relentlessly progressing Stella finished a portrait miniature which she had started in May of H.M. Queen Elizabeth II. Her sight was so poor that her daughter Pat had to secretly help her finish it. The sittings were at Buckingham Palace. June, the ITV arts program, 'Aquarius', filmed Stella over two days for a 45 minute documentary. It was due to be broadcast in November or December. It would have positioned Stella as the foremost portrait miniature painter of the 20th Century. Sadly due to a change of producer at ITV it was never broadcast, and in 1978 the program changed its name to ‘The South Bank Show’. (I wish I could get a copy of the footage if it still exists). 5 January, Stella received an Australian passport (in addition to her British one). She wanted to visit her homeland again and her relatives, especially her elder sister Eileen. Sadly she never did. Stella was touched by many letters of congratulations and particularly one from the Parliament of Australia (24 January 1979). January, Stella resigned from Royal Society of Miniature Painters, Sculptors and Engravers, due to her now almost complete blindness. She was offered Honorary Retirement Membership. She moved to live with her daughter and son-in-law, Pat and John Pettifer, at Norton Court in Kent. 18 November, Stella died in Kent, England. She is buried next to Monty at Norton Church. Their daughter, Pat, and son-in-law, John, are also now there.